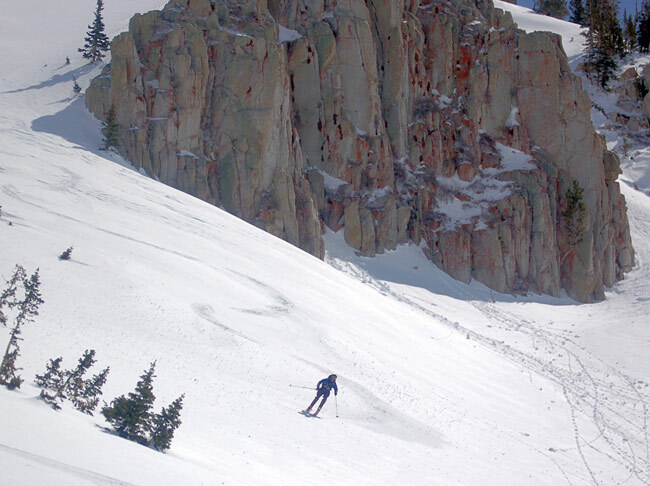 Alta lifts to Rocky point, descent and ascent of Wolverine. 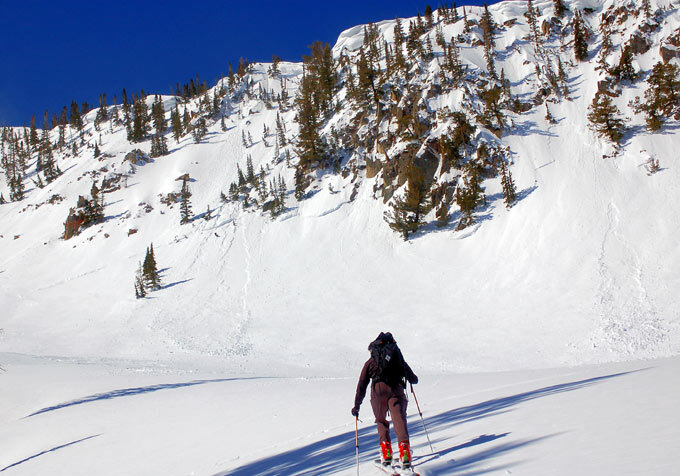 Descent of Stupid chute to Twin Lakes. 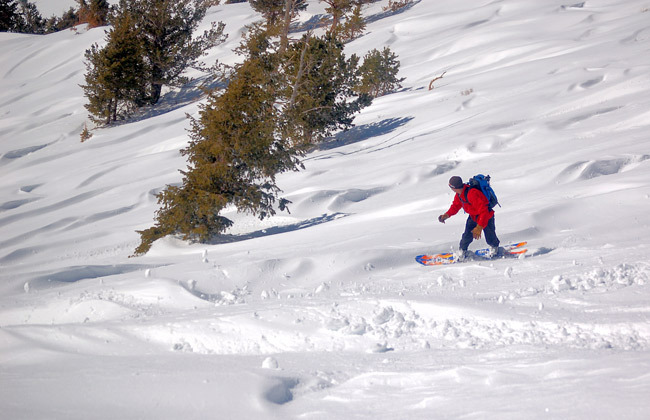 Up and over to east bowl, descending out Silver Fork. Rain showers switching to snow. Moderate temperatures. Winds were gusting over 50+ mph along the upper ridges. Much less wind in the drainages. Lightening at several times. The old surface was well frozen at the upper elevations becoming less so with descent. Puddles were common on the Silver Fork road exit below 8’000 feet. There was perhaps an inch of new sideways snow extending into mid elevations. It began as graupel changing during the squall passage. 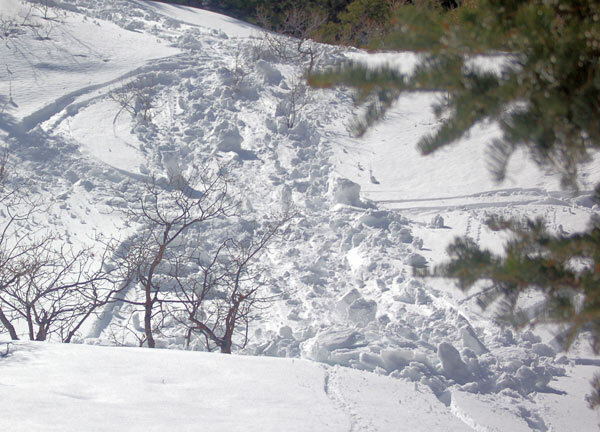 A small slide of about 4” deep and 10’ wide was triggered ski cutting off the ridge on the east bowl. It ran almost nowhere. No other recent slides viewed although just about everything at lower elevations had run within the last day or so in LCC from Coalpit #4 to Maybird. 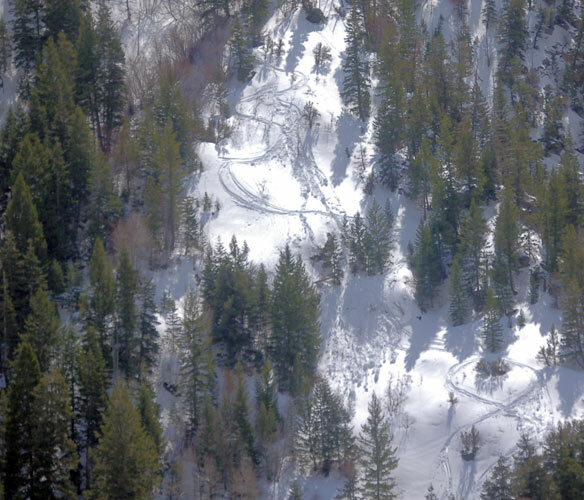 Extensive natural wet slides on the east facing above the low angled boulders in Maybird. There were also widespread clinkers on the west facing as the exit down Silver progressed. 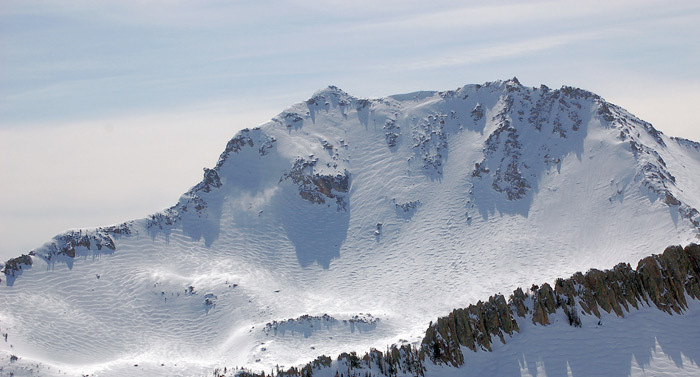 Crusts were forming at mid elevations, likely locking up the wet activity for the present. It was not a user friendly day in the mountains, with thunder, lightening, high winds and almost no visibility at upper elevations. I bailed. 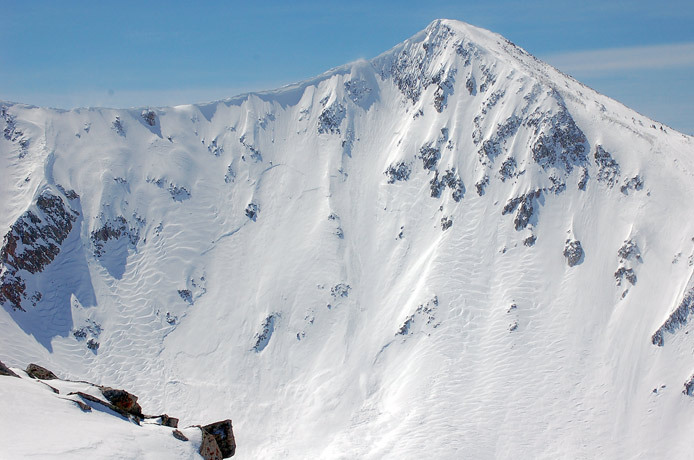 Avalanche activity would be dependent on new snow amounts. Bonding was marginal at the beginning of the storm but should increase. Wet activity is on hold unless it warms up again. A trip to the dentist prevented an early start so, I skinned up Gobblers from Porter Fork reaching the ridge. Descended making a six hour day. Snow, dense and heavy lightening somewhat with elevation gain. Winds above about 8’000 feet were gusting in the 30 mph range. Winds at 10’000 feet were constant 30 mphfrom the northeast. Temperatures were mild at 6’000 feet gradually cooling. !0 inches on the road as I began with a significant density inversion under the top couple of inches. This made for slow but not arduous skinning. The depth of the new and the underlying slab both increased with elevation gain. 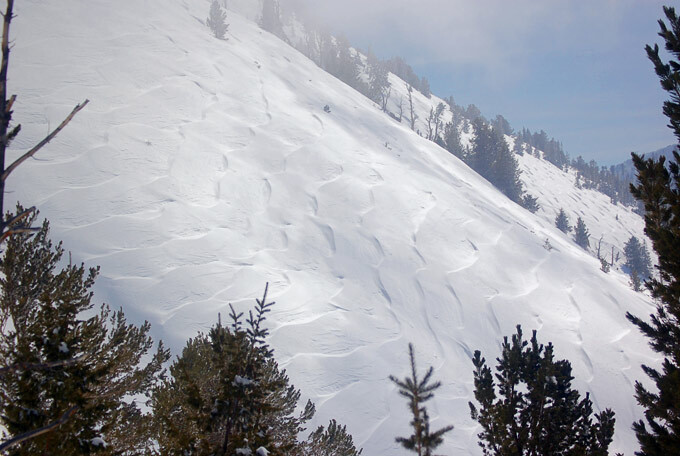 Winds were blowing the snow into drifts above 8’000 with the old surface exposed in an alternating pattern. Drifts were 2’ deep in places but pockety as hell. The old surface was a firmly frozen crust in the drifted areas. It had not frozen completely at lower elevations. By the time of descent all up tracks were gone and I broke trail back down Porter. Total snow is in the 16-20 inch range. 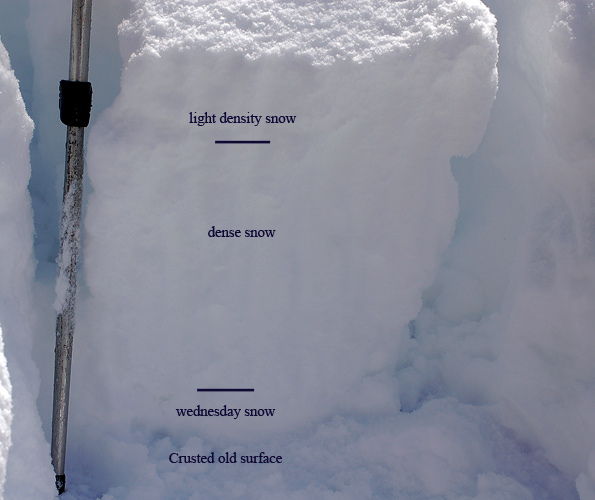 With at least two significant density changes within new snow and all snow overlying a stout crust and the amount of wind during the day, stability would be judged as poor. As usual, without persistent weaknesses most of this should settle quickly. However, because of the amount of snow and the firm bed surface I would guess the settlement will not occur overnight. Avlanches within new snow layering are probably going to step down to the crust, resulting in good size and rapid movement. 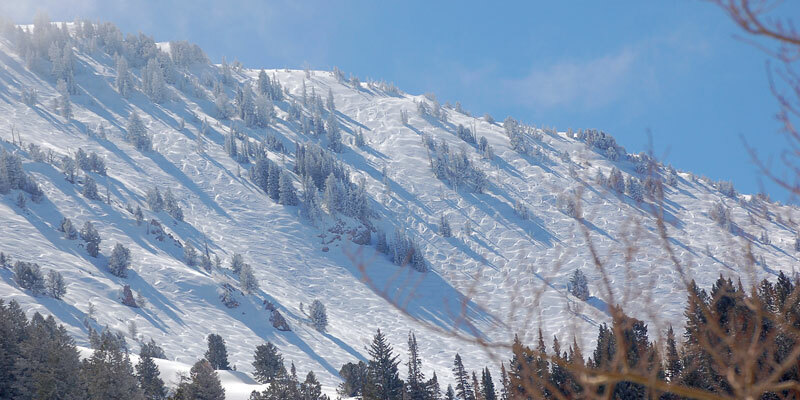 The current forecast of clearing will result in significant potential for good sized slides on sun exposed with warming. Bowman trail to the Gobbler’s ridge. Descended to Baker Springs. Back up and ver the top for a descent of the main face and out Porter. It started as a bluebird mostly continuing except for some pesky upper elevation clous during mid day. Moderate to mild temperatures. A little breeze from the south in the afternoon. Several inches of light density snow capped off the dense wind blown snow from yesterday. There remained 12+ inches storm total even after settlement. Snow on the northwest facing was wind damaged with a scalloping pattern. Wet slides on east facing began before noon and continued mostly at mid and lower elevations. East facing Raymond had no activity and not was noted in Mineral fork, Broads or Mill B south. One of the slides took out a portion of the popular up track in west Porter including a portion of the ski hill. The mid and lower elevation exit was dampened by afternoon with increasing severity as elevation was lost. Except for the wet activity and some naturals during the storm, no recent naturals were viewed. 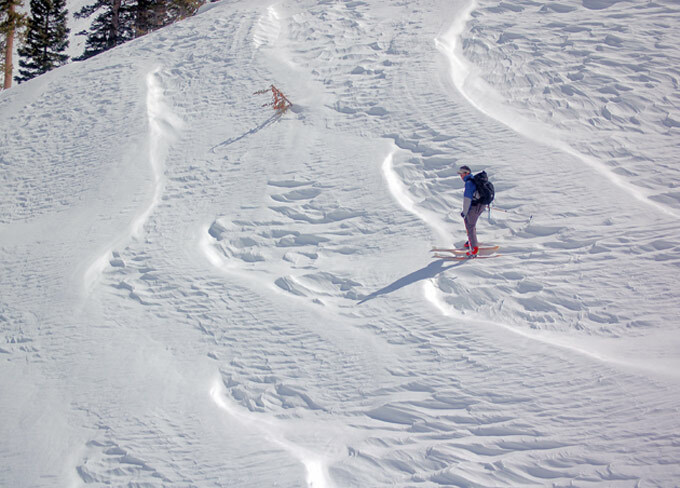 Wind drifts were skied through with no evident cracking or movement. Warm temperatures did a good job of settling out the new snow. I’d expect some localized active wind drifts at upper elevations and further limited wet activity with warming. Winds will need to be strong to move much of the current surface snow. White Pine parking to Maybird. Descent of the northeast facing next to the monolith well down the lower angled boulder field. Ascent with descent of the Hogum 200 continuing out Hogum. Moderate temperatures with a breezy south wind. The wind was in the 20+ range for a few hours in the morning but, it moved minimal snow. Rapid warming in the early afternoon. 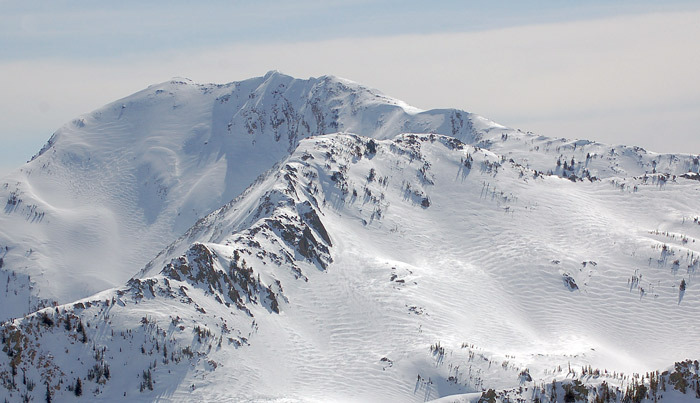 Much of the upper elevation snow was damaged from wind and sun. 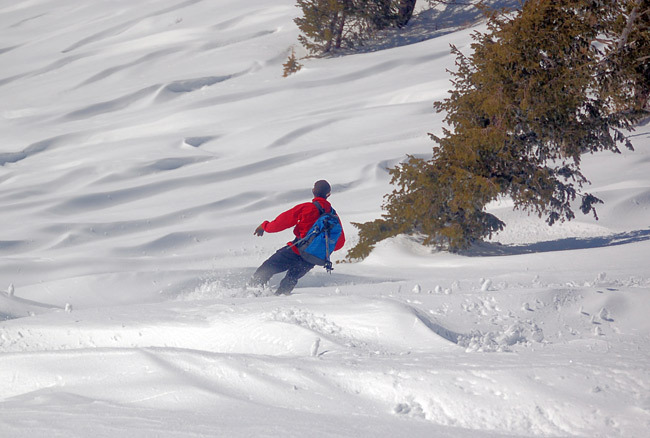 The sheltered areas in the trees retained some soft and settled powder. A wet slide yesterday afternoon buried the Maybird bridge coming off the rock bands west facing. There were several other slides observed on that aspect. Most of the wet activity was on east facing and mid elevations. Several in the Hogum area below the needle were quite large and one took out some small trees. 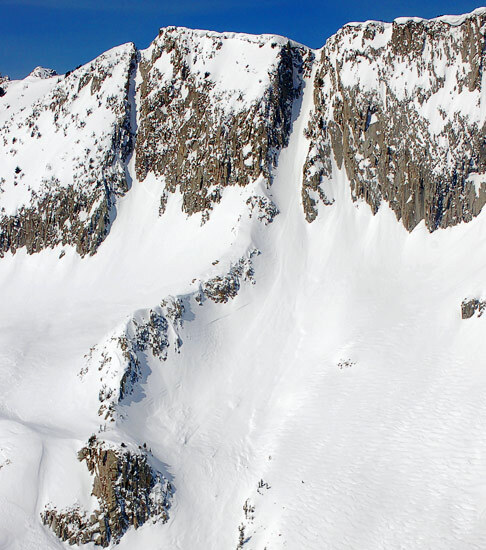 An extensive dry snow slide cycle occurred during the storm in Hogum, also on the east and north facing aspects, including the back bowls under Thunder ridge, the Sliver, the north facing buttress in the back of Hogum etc. 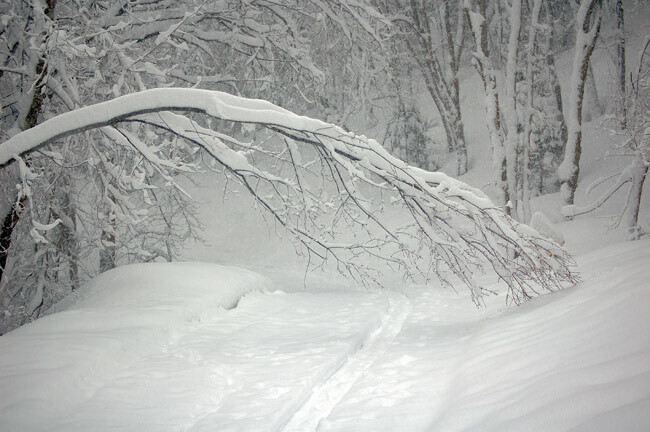 The lower elevation descent was wet saturated snow in the early afternoon, with rollers cut out achieving large sizes. 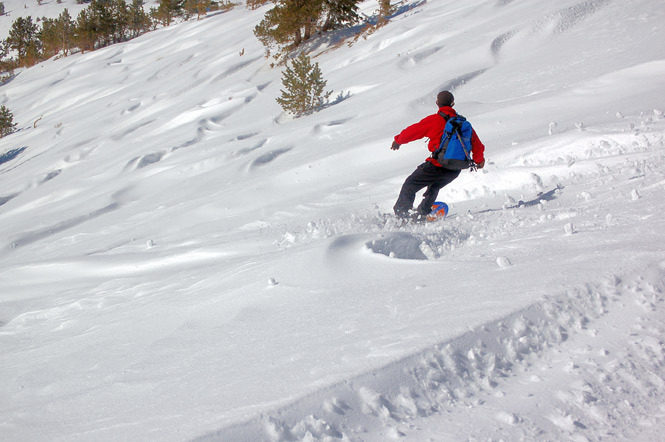 Small localized wet slabs were also cut out entraining all of the new snow down to the old crust. Upper elevation snow has settled nicely and is, for the most part, glued in place. Daytime heating created more than enough warming to make mid and lower elevations loose and active. I’d expect more of the same with the current weather forecast. The forecasted clear skies should allow a cooling even with near freezing overnight temperatures.